With the proliferation of organizations supporting candidates and issues in Boulder City Council elections, it becomes ever more difficult to track who is supporting whom. Fortunately, in a city where many have advanced degrees, we can use a bit of that learning to shed light on the race. This opinion piece uses some of the statistical tools you might have studied in college to create the attached map of the candidates. First, some technical notes and jargon. I was interested in seeing how those who support Boulder civic organizations share that support with candidates. My primary data source for the candidates is their nominating petitions, each containing the names of people who cared enough to travel to city hall and act as nominators for the candidate. Similarly, I collected lists of the supporters of civic organizations. I went to web sites, looking for the names of steering committees, boards of directors, staff, and so on. Finally, I went to issues of the Daily Camera from past election seasons and found ads listing the supporters of the 2013 “No on 310” and 2015 “One Boulder” campaigns. From all this information, I created a distance matrix where candidates and civic organizations are closer if they share many supporters and more distant if they share few supporters. I then used multi-dimensional scaling to collapse the distance matrix down to two dimensions so it could be plotted, cluster analysis to identify important clusters, and a heat map to understand what each cluster represents. 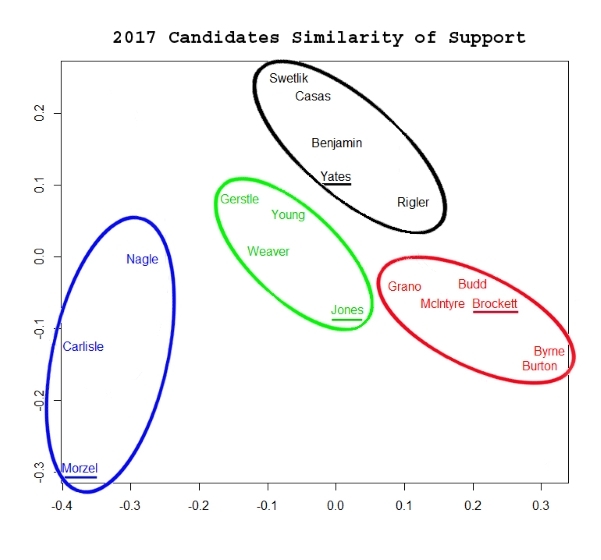 In short, those whose names are closer together on the map have more similar support structures than those who are far apart. Note that this map has nothing to do with geography and it is has nothing to do with what the candidates themselves say about their candidacies: it is based entirely on how their supporters are arrayed among organizations and issues. However, it is probably fair to say that the map represents how supporters expect their candidates to act while in office. We would, for example, expect Ed Byrne and Jan Burton, who are close together on the map, to act similarly in office but we would not expect the same of Byrne and Lisa Morzel. The map locates the 14 candidates and the 4 existing council members (underlined) who are in the middle of their terms. Interestingly, each of the 4 clusters contains a mid-term member. To help understand the clusters, remember that supporting “No on 310” roughly equates to supporting the muni effort; supporting “One Boulder” equates to encouraging, or at least abetting, continued population growth in Boulder; and supporting “Livable Boulder” equates to believing that growth should pay its own way. Candidates in the black cluster tend not to share supporters with civic organizations. From this perspective, they are wild cards, deriving their support from people who are otherwise not much involved in community organizations. To a large extent, then, we can understand these clusters by looking at views toward growth and views toward the muni. That makes sense given the continuing bitter struggle between the city and Xcel and the relentless pressure to expand the city’s boundaries, outward, upward, and inward. We have one mid-term council member in each cluster and similar candidates nearby whose election will tip us toward more growth or limited growth, and toward municipalization or throwing in the towel on the muni. This is a watershed election. As for me, I will not vote for a wild card candidate from the black cluster and I will not vote for the accelerated growth of a candidate from the red cluster. I will vote for candidates from the blue and green clusters: I will vote for Carlisle, Nagle, Gerstle, Young, and Weaver. Please join me, because an unthinking vote―or no vote at all―pushes us closer to an out-of-control growth that will submerge the unique character of our city in a sea of generic urbanism.